3.8 out of 5 based on 28 bloggers and 3 commenters. 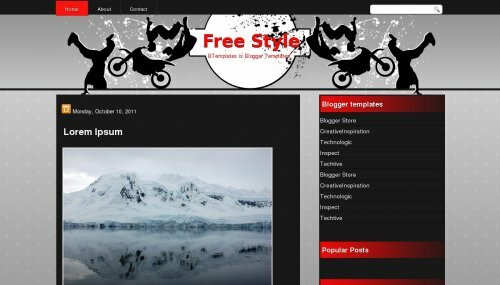 Free Style is a free blogger template with 2 columns, right sidebar, footer columns and vectorial elements. Excellent template for blogs about art or sports. Alinne lopes artes habilidades talentos,blog para todos que tem algum tipo de habilidade,dom,talento!! h0w t0 c0py this URL ??!! Thanks you very good theme..